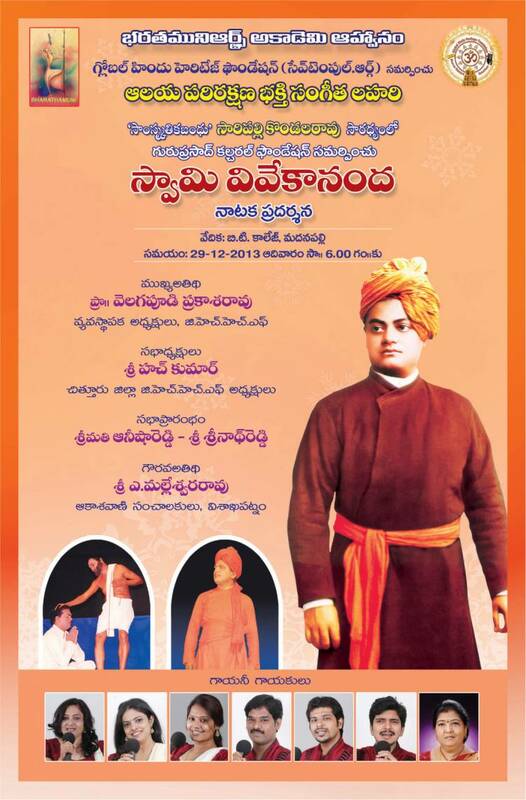 GHHF requests you to encourage your family and friends to attend two significant events taking place in Chittoor District at two different places: Madanapalli and Tirupathi as apart of Swami Vivekananda 150th Birth Anniversary. These events will be in TELUGU language. 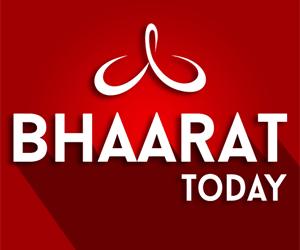 1) Bharathamuni Arts invites to attend the presentation of SaveTemples Bhakti Sangeetha Lahari. The songs on the significance of Temples and our rich ancient culture will be presented by Savetemples Band consisting of eight member. Also Guruprasad Cultural Foundation under the leadership of "Samskriti Bandhu" Sri Saripalli Kondala Rao presents Swami Vivekananda Play. Special invitees: Prof. Prakasarao Velagapudi, Sri Hutch Kumar, Srimathi Anisha Reddy, Sri Srinath Reddy and Sri A Malleeswara Rao. 2) Yuvakalavahini invites to attend the presentation of SaveTemples Bhakti Sangeetha Lahari. The songs on the significance of Temples and our rich ancient culture will be presented by Savetemples Band consisting of eight member. Special Invitees: Prof. Prakasarao Velagapudi, Sri M. Venkataramana, Sri Hutch Kumar, Srimathi Anisha Reddy, Sri Srinath Reddy, Sri A Malleeswara Rao, Sri Raghu (Bheemas), Srimati N. Vasanth Kumari, Sri K N Balaji, Sri K S Vasu, Sri Eka Vijayakumar. 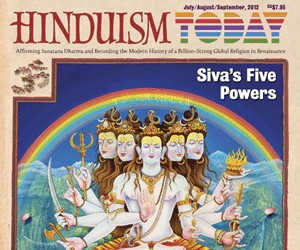 Savetemples Bhakti Band artists: Adarshini, Phani Vamsi, NSL Praveena, Swaroopa, Om Prakash, Srinivas sharma. 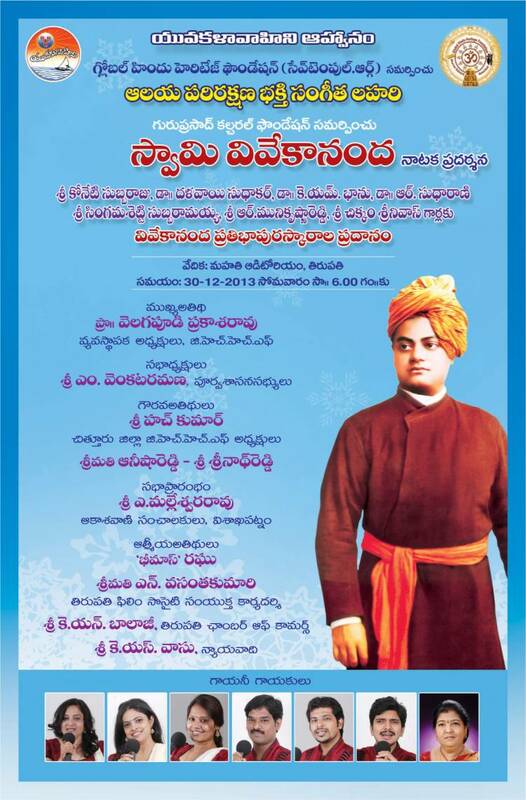 Enclosed are three invitations printed in Telugu language. Please encourage all your friends and family members to attend.